Arroz con Pollo ("rice with chicken" in Spanish) is a traditional dish that is common throughout Latin America and the Caribbean, especially in Cuba, Colombia, Panama, Puerto Rico, Costa Rica, Honduras and the Dominican Republic. Common ingredients include rice, beer, stock, sofrito (a mix of vegetables and fresh herbs), chicken, and saffron or more authentic and commonly annatto. 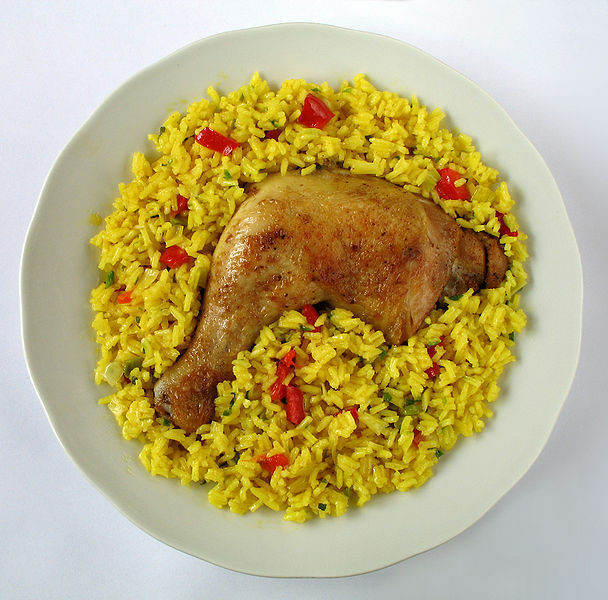 Considered to be a Puerto Rican unofficial national dish, "arroz con pollo" or "rice with chicken" is claimed to be native to Puerto Rico. The dish has roots in the motherland of Spain. Arroz con pollo dates back to the eighth century when the Moors occupied Spain and influenced the way they imported and exported goods, along with the way they ate. Many other ingredients the Spanish added were beef, pork (chorizo), rice, wheat, and olive oil. 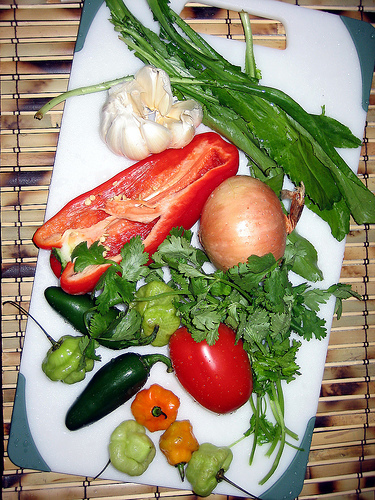 Left: Ingredients for Puerto Rican Sofrito. A mixture of dry spices, including cumin, oregano, granulated onion, garlic powder, salt and black pepper. Chop up the ingredients for your sofrito in a small bowl. Preheat a medium-sized casserole pot with the achiote infused olive oil. If you aren’t able to find achiote, plain olive oil will do nicely. Brown the chicken until seared and caramelized and golden brown (about five minutes over medium heat). Next add the sofrito and sautee for another ten minutes. Add the tomato paste, Spanish olives, black pepper and bay leaves. Stir and cook for 20 minutes (covered), until chicken is fully cooked. Stir in rice thoroughly, then add the chicken stock and beer and bring to a boil at medium high-heat until most of the water has evaporated. Finally stir rice and chicken and reduce heat to a simmer. Let cook for another 20 minutes (covered) or until rice is softened.